When we were in Florence, SC…Becky made this amazing concoction for me. She had been talking and raving about it forever, and when we finally got around to making it, I was sorry I hadn’t taken her up on it sooner! She got the recipe from her friend Tami, and then Tami told me it was a variation of Sarma’s recipe, called the Bunny Spice! It was such a funny coincidence…being that One Lucky Duck is sponsoring us. Yet another reason to get Raw Food Real World! This drink ROCKS my world. Even if you don’t have a juicer, you could food process the carrots and ginger with a little water…and use a cheese cloth or nut bag to squeeze out the juice. Or, you could get carrot/ginger juice at your local juice bar and hurry home to make it (juices are the most powerful within 30 minutes). Or, if you could even process the carrots/ginger to break them down and then blend them with the rest. It may not be as smooth, but I just want everyone to try this…it’s so unique! The spices are what make it so addicting…so play with them until you find your perfect mixture. I tried to get Becky to give me true measurements (because I’m a recovering obsessive measuring addict! )…but she doesn’t roll that way 🙂 Also, you must serve it in a wine glass or other beautiful drinking vessel…because it makes it “magical”. hee hee! So here it is…enjoy! Juice carrots and ginger. Add to blender with frozen bananas, nut milk, and spices. Blend and drink! Entry filed under: Carrots, Juicing. This looks delicious! 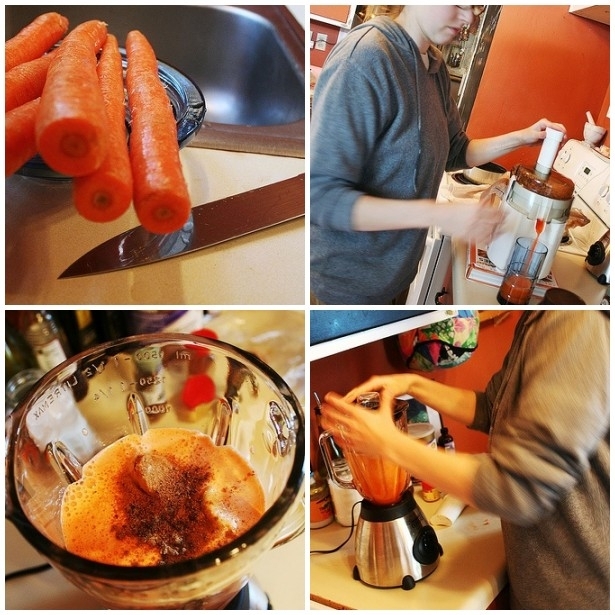 I’ve never been one for carrot juice, but something about this recipe is so tempting! Maybe it’s time I give it another try. Wow! This sounds yummy! I have to try this soon. darnit! Another thing I’ll probably be obsessed with making! i am SO not a fan of carrot juice, but ginger… i am a fan of ginger… and almond milk… and bananas… i guess i’ll have to give it a go. OMG… thanks for sharing this sweet recipe! I have all the ingredients, a juicer and plenty o’ wine glasses so I’m off to make one this instant! Squeeeeeeeee! girl, i so got a big ole bag of yummy carrots today to rock this out tomorrow….i am so glad you like it sara…..all smiles…. I love carrot juice! I have a new blender on the way and can’t wait to use this recipe and some of the other green ones you’ve shared! Oh I am so going to try this! I made my first green smoothie this week. I loved it and so did my 3 year old! I’m anxious to try this carrot drink- but we don’t have a juicer. I don’t think we’d use one too often…any recommendations for a good basic (not too expensive) juicer? Also, I was going to ask you if you have the 3 hp blender, or just a normal weak one…Thanks and I LOVE your blogs! Sarah…no, I just have a normal blender right now. Still saving up for the Vitamix! As far as juicers, you can usually pick up a used Champion on Craigslist for not to expensive, or just check epinions.com for juicer recommendations. We have a Champion and I love it. Whoa — we just made this and WOW!! Zach and I spent all morning juicing and blending and drinking and giggling! 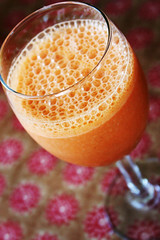 I just made my own form of this…don’t have a juicer but added carrots, soy milk, honey and some spice…really yummy. It’d be even better with a juicer but still really good.